The iPod touch is turning out to be a whole lot more than just an MP3 player. With so many people using it as a web browser, gaming device, video player and more it’s no wonder that Apple recently gave it a speed and memory increase ahead of an all new iPod touch 3G that should be out next year. 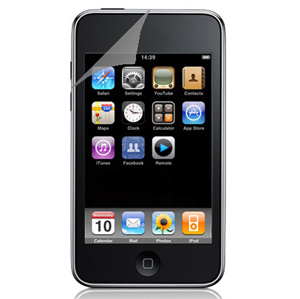 As the iPod touch has so many uses, looking after it and keeping it protected is essential. There are a loads of cases available for it so I thought I’d put a quick guide together that shows off our most popular cases for the iPod touch 2G. I’ve been a big fan of InvisibleShield for a while now and have had one fitted to my iPhone 3G since I got it on launch day last year. If you’ve never seen them before, they are a very thin, tough plastic coating that sticks to your phone. It covers both the front and back of your phone and is the best protection I’ve found if you don’t want the added bulk of a case. On the Zagg website, they attack the screen of a phone using a small drill/grinder – half of the screen was covered with an InvisibleShield the other half unprotected. Needless to say, the half that wasn’t covered was absolutely destroyed, the half that was covered was perfectly fine and not a hint of a scratch. InvisibleShields don’t use adhesive and can be removed easily if need, although you will need a little patience to fit it to your iPod touch. InvisibleShields won’t cushion your iPod if you drop it, but they do prevent scratches and fingerprints as well as add more grip to the otherwise slippery iPod touch.